It’s another typical Wednesday evening on Duke University’s East Campus; typical only because for the past seven years, the White Lecture Hall has hosted, The History of Hip-Hop, a collaborative teaching experience between Grammy Award-winning producer Patrick Douthit, aka 9th Wonder, and Professor Mark Anthony Neal. On this particular evening, Douthit, a founding member of North Carolina’s Little Brother, is launching into a lecture about standards. It is a conversation that began days before as a Facebook post about Ruth’s Chris Steak House, Steak-Ums and the T-Bone that you can acquire from The Waffle House -- and it was not lost on the 100-plus students in attendance on this evening, that the subtext to the lecture was “Shether,” Remy Ma’s recent shot at Nicki Minaj. Douthit asked the students to crowdsource criteria for what makes a classic rapper. The lecture ends with a reference to Douthit’s now legendary rant-turned-lecture, “They Give Out Too Many M*fking Jerseys,” a riff off on Chuck D’s notion that unlike elite levels of organized sport, Hip-Hop has become a site where “everybody” thinks they can be on the field. Sitting in the audience this night is Timothy Anne Burnside, a curatorial specialist at the National Museum of African American History and Culture (NMAAHC), but who is, most notably, the woman who acquired the legendary J-Dilla’s equipment for the then still-under-construction museum in 2014. Later that evening -- the class meets once-a-week for 2 ½ hours -- Burnside shares that Dilla’s equipment is the most referenced artifact in the NMAAHC, more so than Nat Turner’s bible and Harriet Tubman’s shawl. The revelation is as much about the global popularity of Hip-Hop as it is emblematic of the vision of the museum’s director Dr. Lonnie Bunch and his team to create a “born digital” museum. After class, students approach Burnside to ask how she created her own lane with regards to digital curation. 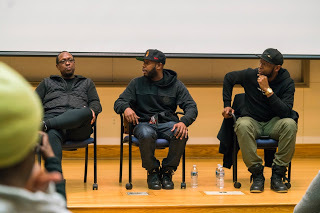 Two weeks earlier Brooklyn rapper Talib Kweli joined Douthit and Neal on stage in class, as part of a four-day residency that is part of Duke Performances’ Hip-Hop Initiative led by Aaron Greenwald. Over the past seven years, artists and thinkers such as James Braxton Peterson, Jason Moran, Joan Morgan, Yaba Blay, Ronald K. Brown, Eboni Marshall Turman, Bakari Kitwana, and Blitz the Ambassador, are among those who have visited the class. Included in that group is Rapsody, signed to Douthit’s Jamla label, who sat in the classroom audience many times, well before anybody heard her collaboration with Kendrick Lamar (“Complexion”) or about her joint deal with Jamla and Roc Nation. As the class is also open to the public, it is not unusual for students from North Carolina Central University -- a local HBCU -- or UNC-Chapel Hill, to sit in, as well as community members, like Lamont Lilly who was the vice-presidential candidate for the Workers World Party. The centerpiece of The History of Hip-Hop is, of course, the collaborative relationship between Douthit and Neal. The two first met in the studio of the local public radio station, WUNC(91.5), and began a fast conversation about fatherhood and Pete Rock & CL Smooth’s “They Reminisce Over You (T.R.O.Y. ).” That initial conversation morphed into series of public events, including “Sampling Motown,” a public conversation held at the Nasher Museum at Duke where they were joined by Harry Weinger, a Grammy Award-winning producer and Universal Records executive who, over the past twenty-years, has been charged with caretaking the catalogues of James Brown and Michael Jackson among others. Douthit joined the Duke University faculty in 2010 as an adjunct lecturer, and he and Neal offered the course,“Sampling Soul,” the precursor to “The History of Hip-Hop”, and in which noted Black feminist scholar and activist Dr. Treva Lindsey served as one of the course’s graduate teaching assistants. There were 80 students enrolled in 2010; in the 2017 iteration of the course, there are 138 students officially enrolled in the course, the majority of whom are non-Black. Yet the strength of the course goes well beyond the collaborative energies of the two primary interlocutors -- one a 40-something native of Winston-Salem, N.C.; the other, a just barely 50-something son of the South Bronx; both married fathers of two teenaged daughters. The commitment to collaboration is extended to the class team, including Senior Librarian Karen Jean Hunt, who until her recent retirement, was embedded in the class as research resource. There is at least one Duke alum of “The History of Hip-Hop” course who went on to successfully pursue a master's degree in library science, because of Hunt’s vision of what a progressive, engaged librarian could be. For the past three years, beginning with an experiment that began in Neal’s course “Michael Jackson and the Black Performance” tradition, students have been required to produce digital final group projects. The students are asked to reevaluate classic Hip-Hop recordings in the context of the contemporary moment, with the caveat that the final product must be accessible and spreadable (with a nod to Digital Humanities OG Henry Jenkins) to various social media platform. Archana Gowda serves as the digital consultant to the classroom, helping to facilitate the work of the class. In the first iteration of the digital final project in 2015, students revisited Public Enemy’s Fear of a Black Planet (1990), from which tracks like “Who Stole the Soul?” and “Welcome to the Terrordome” generated some of the most inspired responses. Last spring students took under to consideration two recordings that marked 20th anniversaries: The Fugees’ The Score and Jay Z’s debut Reasonable Doubt. This semester the pool has been expanded to three recordings including The Notorious B.I.G.’s Life After Death (released March of 1997), Erykah Badu’s Baduizm (released February of 1997) and Eric B and Rakim’s debut Paid in Full, which celebrates its 30th anniversary this year. To bring the theme of the digital projects full circle, Rakim is headlining this year’s Art of Cool Festival in Durham in April, giving the students the opportunity to witness the lyrical legend in performance. Though the course is branded as a history of Hip-Hop, for most students the course serves as a history of 20th century Black cultural and political history. Rakim for example, allows not only an exploration of the political economy of Black life in the 1980s, but an excavation of the ideology of the Five Percent Nation -- a street-born worldview derived loosely from the Nation of Islam, which also inform Erykah Badu’s debut -- that broadens our understanding of the relationship of African-Americans to traditional and non-traditional forms of Islam. In the spirit of scholar Tricia Rose’s classic description of Hip-Hop in her book, Black Noise as the process of “flow, layering and rupture,” “The History of Hip Hop” takes serious the idea of Hip-Hop as a broadly defined citation practice; the sampling and citation of Black Culture writ large -- an archival project.